Paul and Karin West are proud to be among Ontario's newest Maple Syrup producers. They set up their sugar shack in Georgetown, Ontario a few years ago. Paul, a mechanical engineer with deep food production expertise, has been refining his Maple Syrup operation to deliver a thicker and richer tasting Artisan Maple Syrup - we didn't even know that was possible! 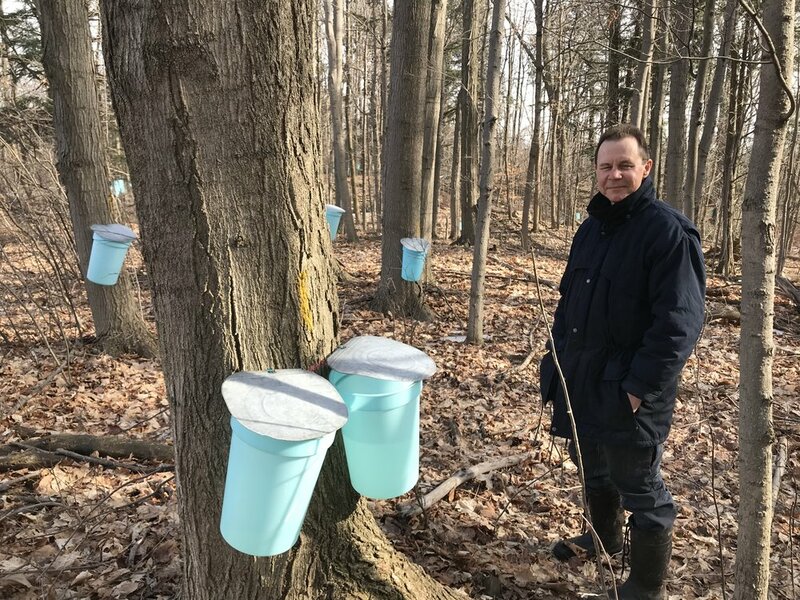 The Wests have tapped over 200 Maple trees on their property - we love the blue collection buckets, Paul! During the short sap-running season, a sap collection run needs to be done each afternoon to capture every drop of Maple sap possible. The collected sap is poured into one of two wood-fired evaporator pans, which concentrate the sap down to 1/40th of its original volume to earn the right to be labelled Pure Canadian Maple Syrup. Paul takes the process one step further, concentrating the hishis Maple Syrup a few percentage s points more to thicken and carmelizecaramelize the syrup. Paul and Karin call their labour of love "North Halton Reserve". We call it delicious! Since we're into all things Canada and miniature, what really caught John's eye was the gorgeous 100ml glass bottle filled with North Halton Reserve that Karin brought out. Seems like a perfect item for our gift shop of "little things". Let us know what you think! And if you'd like a little taste of heaven, order yourself up a bottle of North Halton Reserve by sending Paul and Karin a note at westpr84@gmail.com . As we begin to envision what our Québec destination will look like, and maybe smell like, our minds naturally wander to the history that the province shares with the sweet syrup. Would you like to see nature’s sweetest phenomena of a sugar bush represented in our miniature Québec? I sure would.